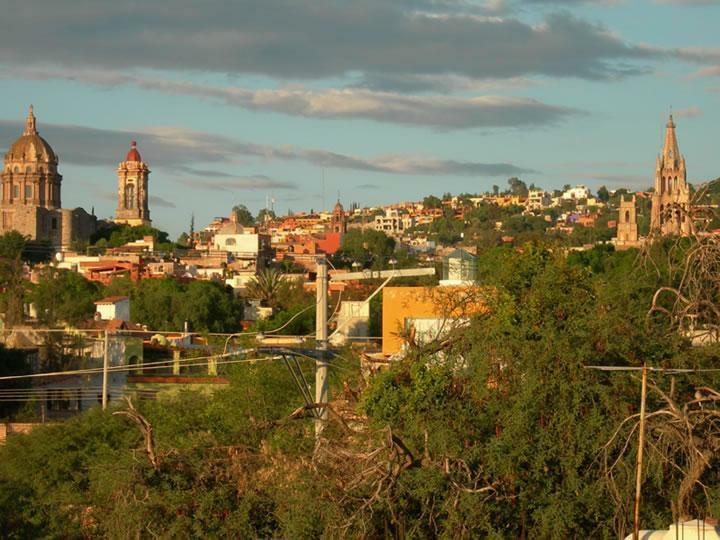 House for rent in San Miguel de Allende. 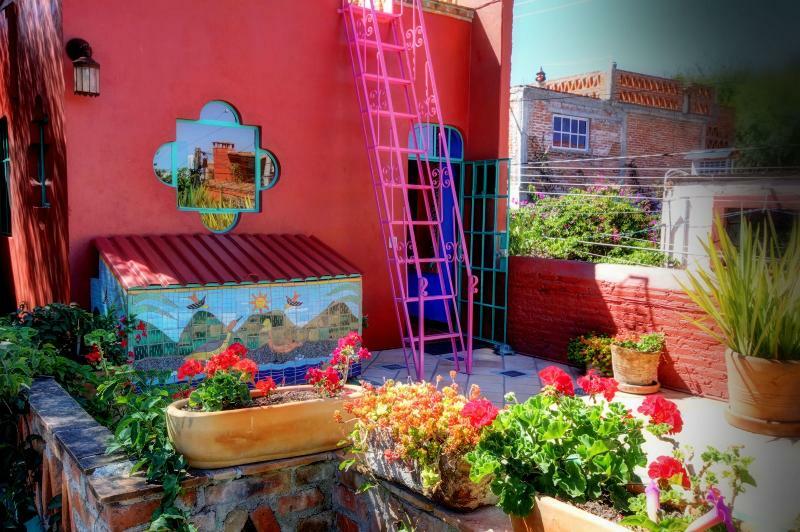 Casa del Alma is the perfect rental in San Miguel. 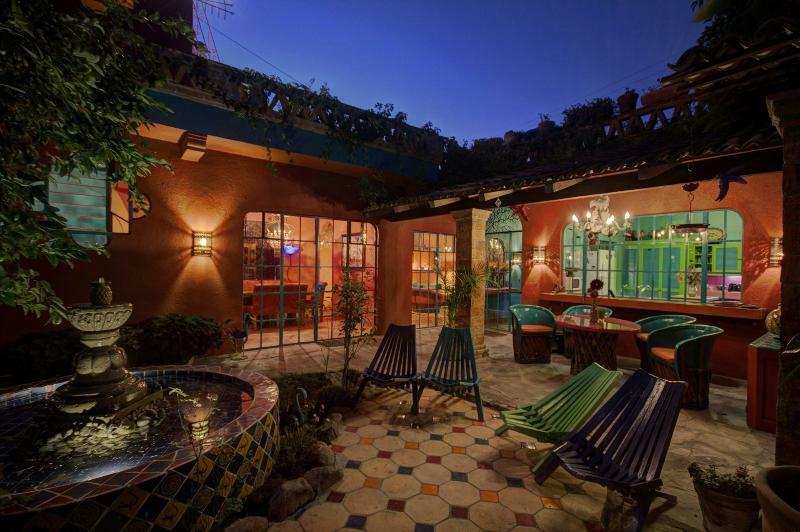 Our stay here at Casa del Alma is as the title implies--JOYOUS. One can not wake up here in a bad mood. 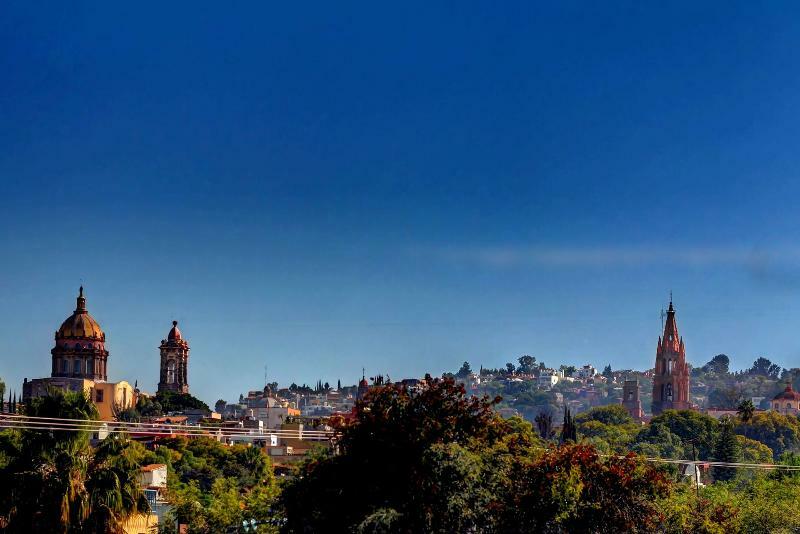 San Miguel de Allende is a captivating place to visit and Casa Del Alma epitomizes the “San Miguel” experience. 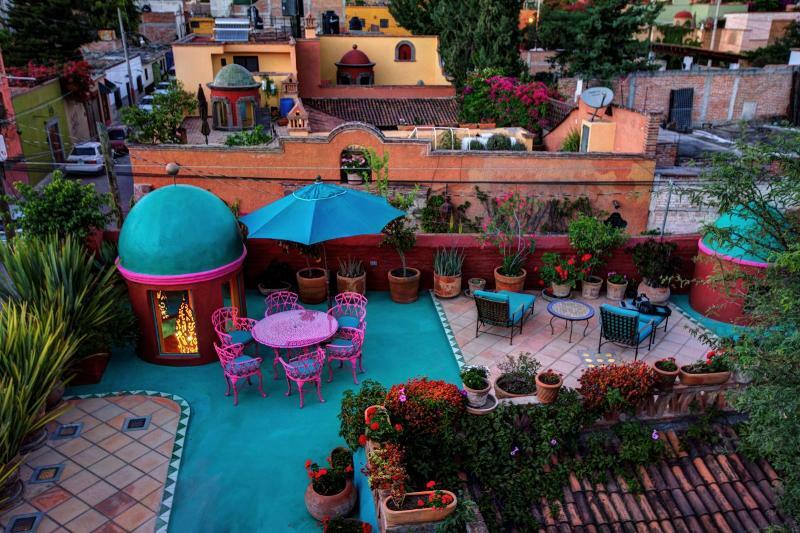 If you are considering vacationing in San Miguel de Allende, you’ve come to the right place. 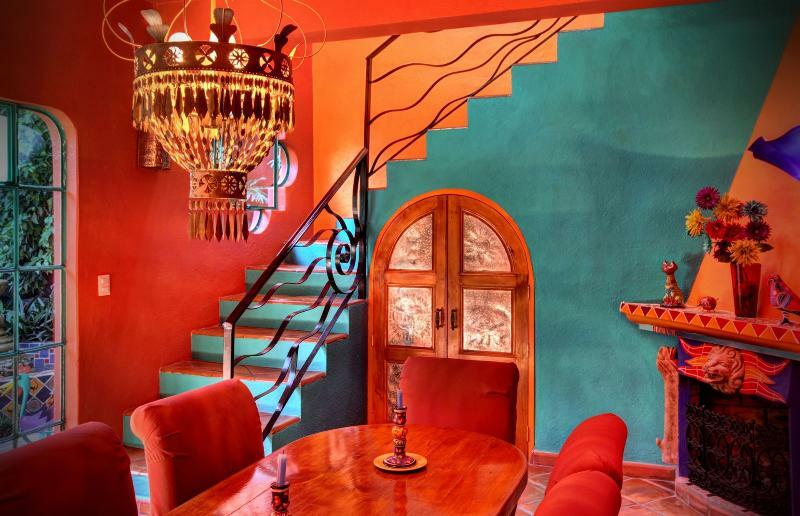 Casa del Alma is THE house to rent in San Miguel. 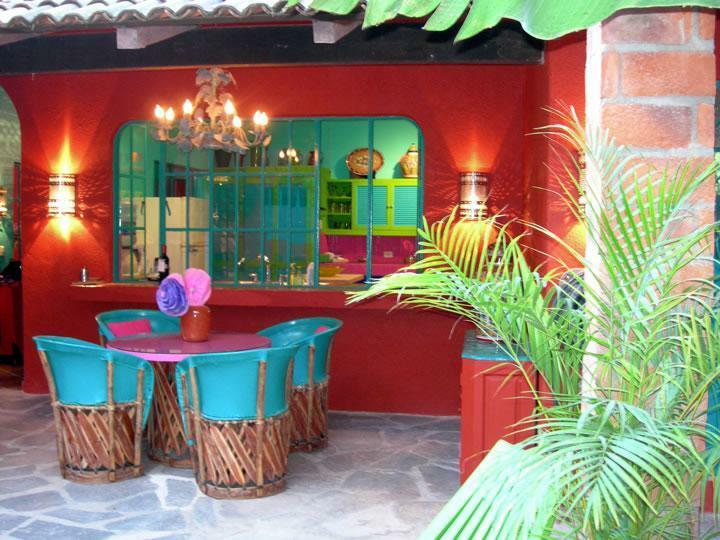 It is likely the best Vacation Rental in Mexico! 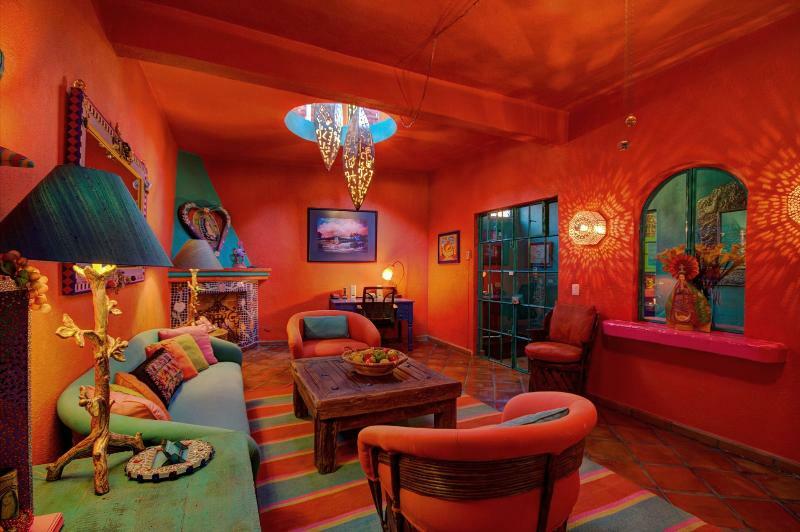 Casa del Alma will seduce you with its color, serenity, and modern luxury. 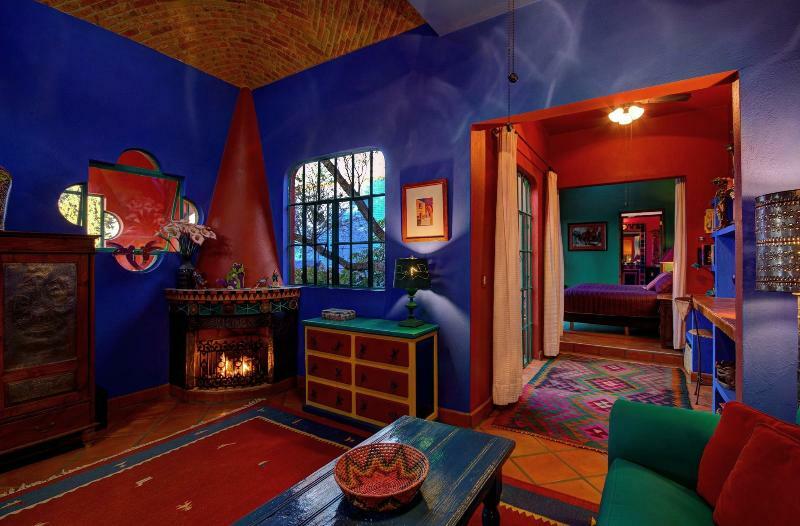 Que una casa! 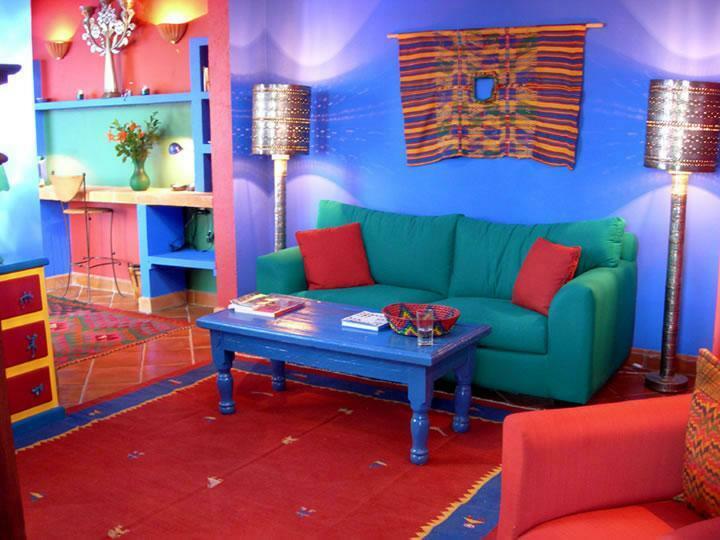 Que colores! Staying in your beautiful home has been awesome. It is so evident the heart and soul that has gone into the creation of such a magical place. 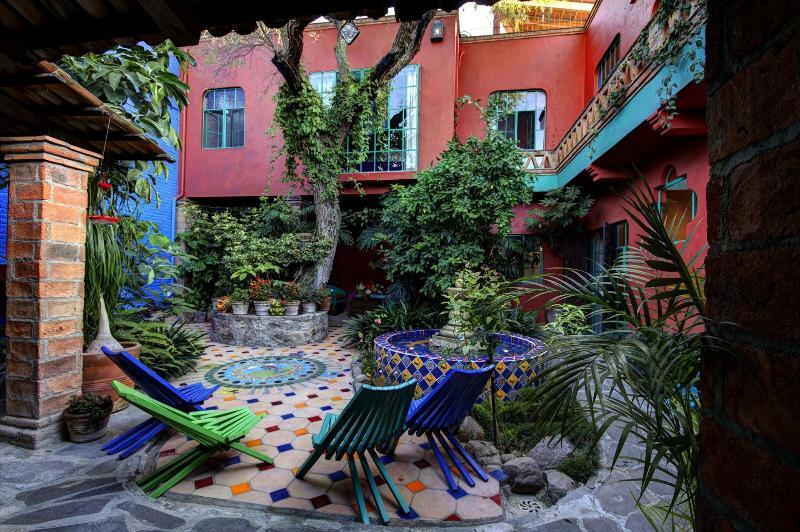 We have had the most wonderful time and look forward to our stay at Casa del Alma next year. 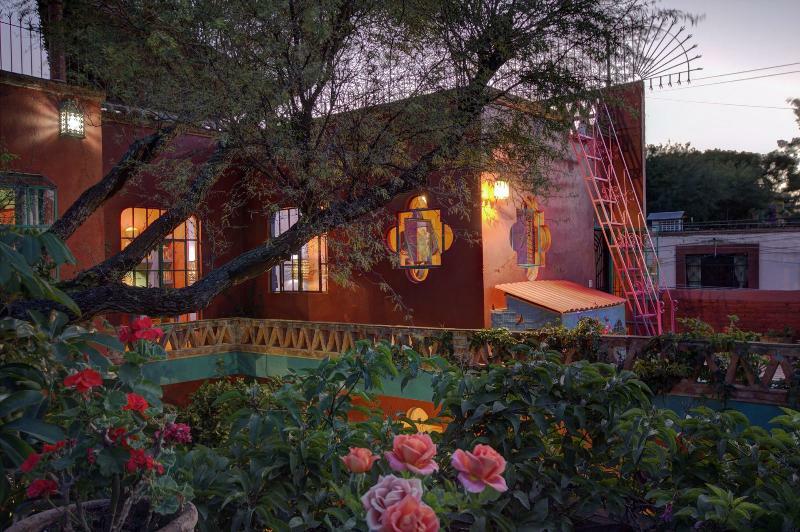 How good of you to share this jewel box of a house. 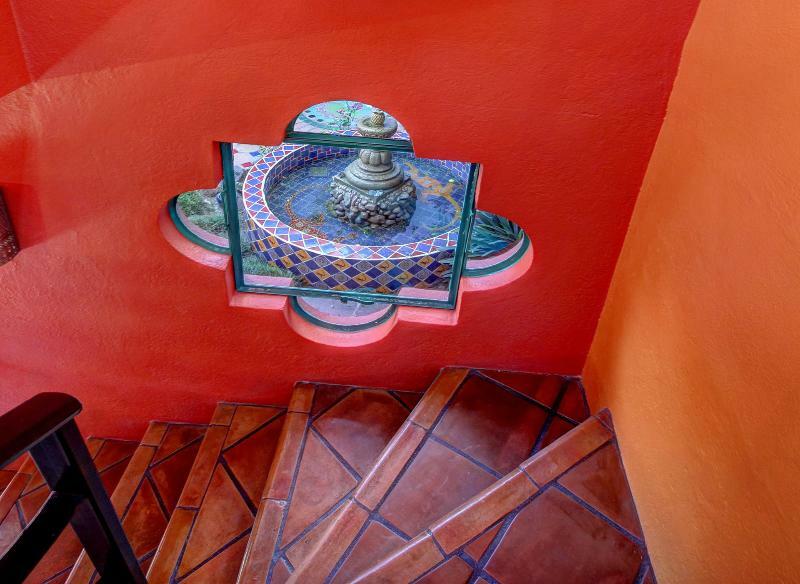 Through our month here, we learned to appreciate the light, the colors, the details of furniture and lamps and the fountain, all playing off each other in a delightful, almost musical synergy. 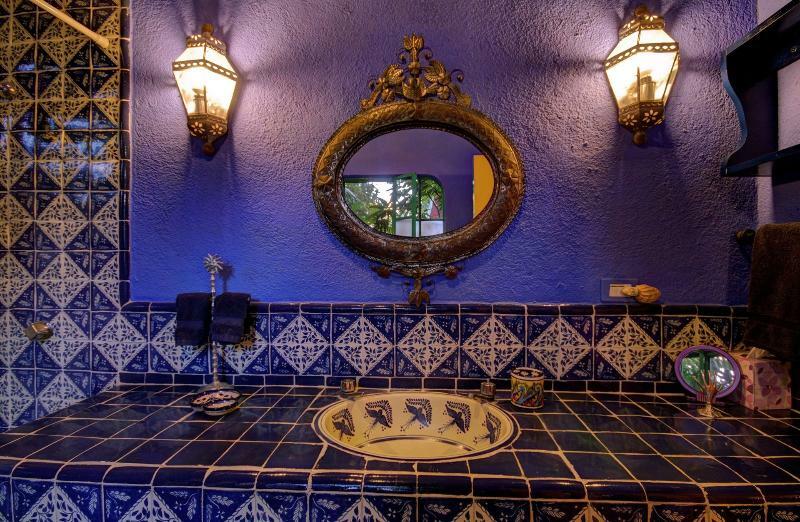 Surely Casa del Alma reflects your soul. 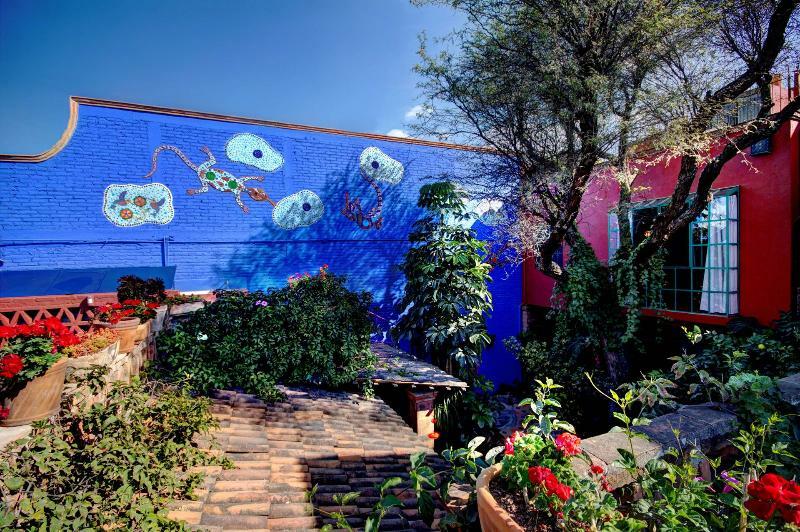 My traveling companions and I really felt "pampered" there in such a colorful sanctuary, and it gave us a nice place to come "home" after a full day of exploring the city… a memorable way to celebrate 50 years on planet. We were amazed at how perfectly well equipped the house was. I think it is the best equipped house we've ever rented. 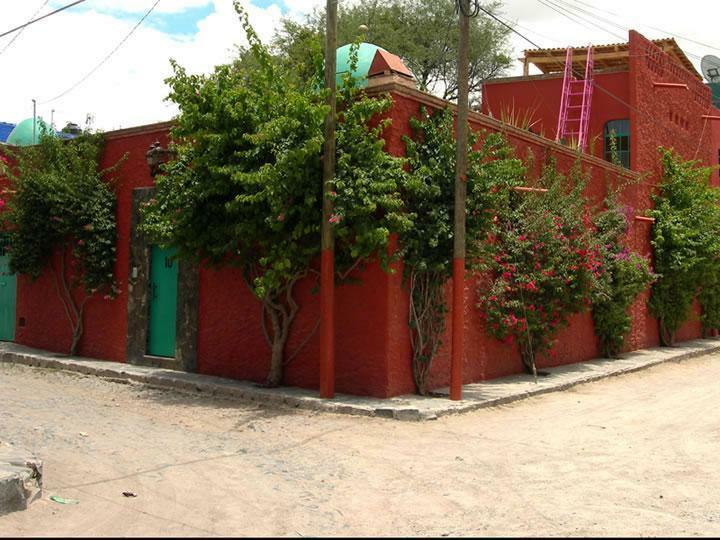 The beds were comfortable and the electric blanket fantastic…We loved Cha Cha Cha and the bakery around the corner. Also thanks for the orange juice tip. 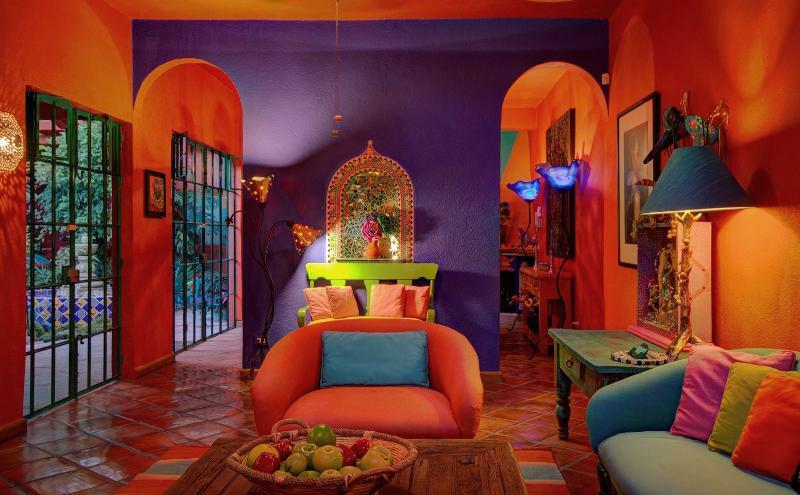 We have stayed in many other houses, in many Colonias and this is by far the most exquisite! 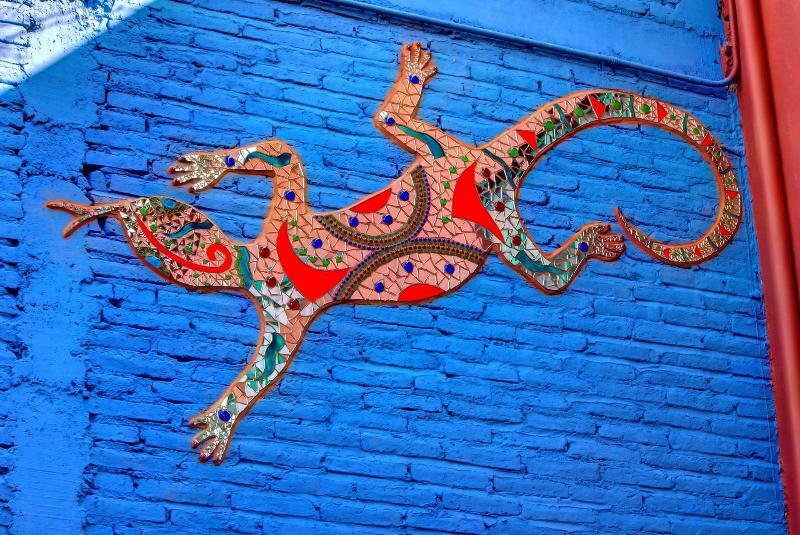 The colorful decor, beautiful artwork and well thought out conveniences have made our stay truly delightful. 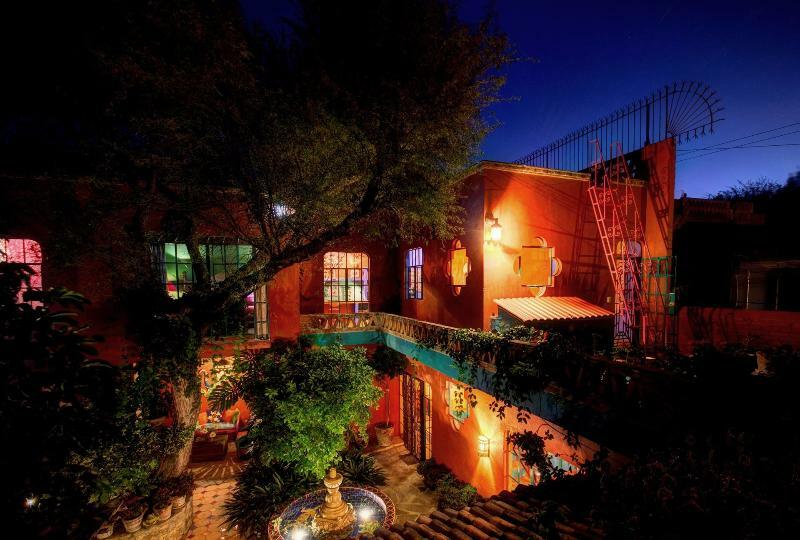 Wanted to let you know how much we enjoyed staying at Casa del Alma. 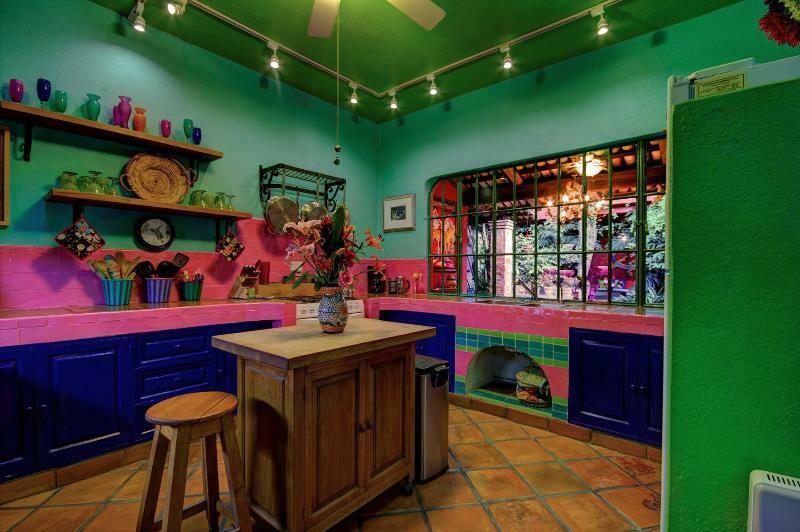 It really should have been featured in "Colors of Mexico." 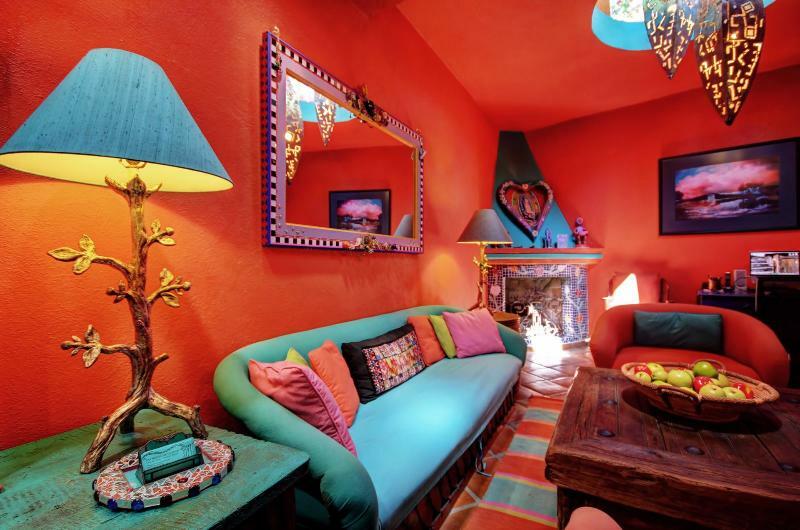 The furnishings were so interesting and beautiful and we did not lack for anything. I think I took as many pictures of the house as I did of SMA. By the way, your "Handbook for the Casa" was very complete and most helpful. We will certainly be coming back in the future. The house was perfect for our friends and us , they stayed upstairs and we down. Very sound-proof. We appreciated the nice linens and towels, and the kitchen couldn't have been better appointed. We both liked to cook , so it was great. We met Seth next door, and the Bakery got a lot of our pesos. The tienda on Rosal was most convenient. Araceli did a very nice job for us. 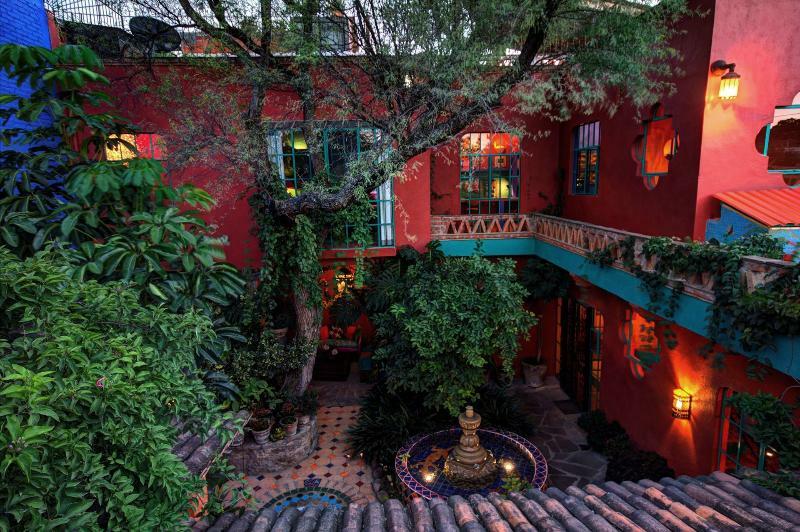 Stan and Joanna's Casa del Alma is a delight! We feel we are living in an Art Gallery. 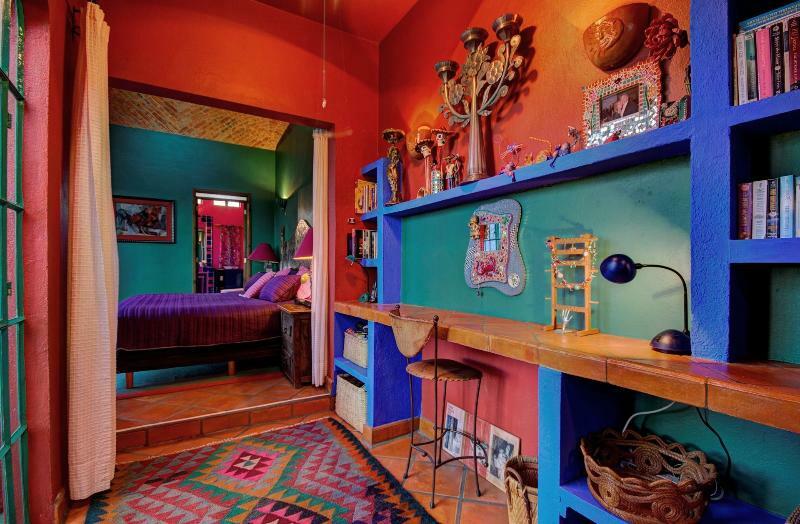 The colors in the house make us think that Frida Kahlo had a hand in decorating. 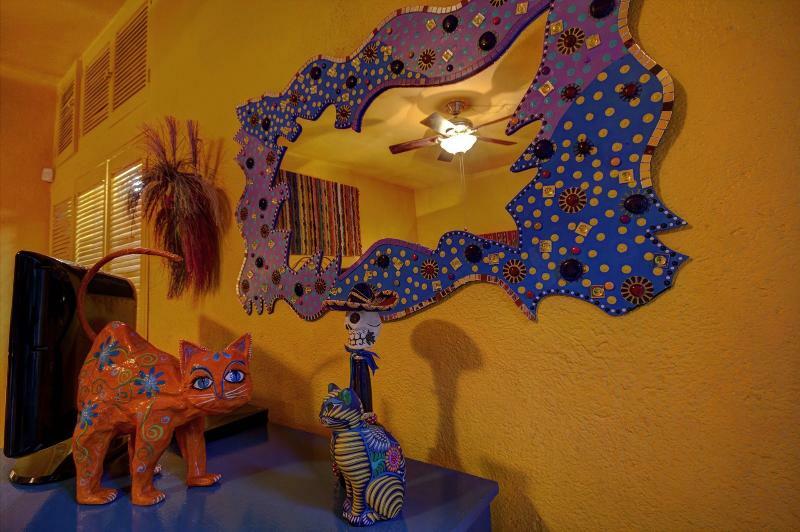 Stan and Joanna have chosen wonderful pieces of art and every little detail from dishes to music is so much more than one would ever expect in a rental...the rental price makes staying here even nicer. 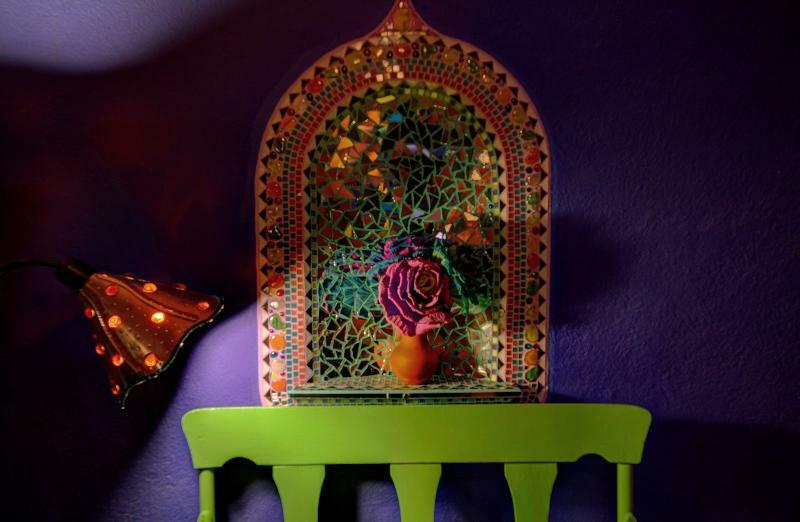 We just love your home, the art, colors, design, comfortability, you have thought of absolutely everything to make it welcoming to your guests. 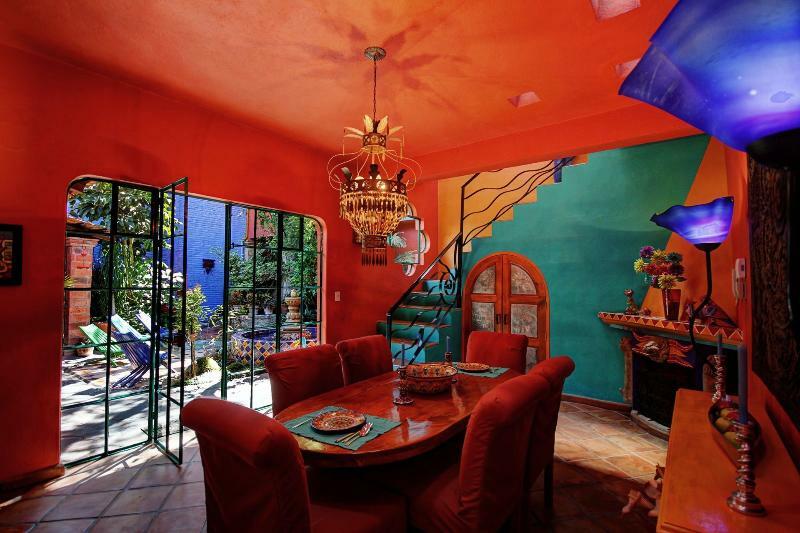 We returned home to Marblehead and so missed the colors in your home, the Mexican art, pottery and flavor. 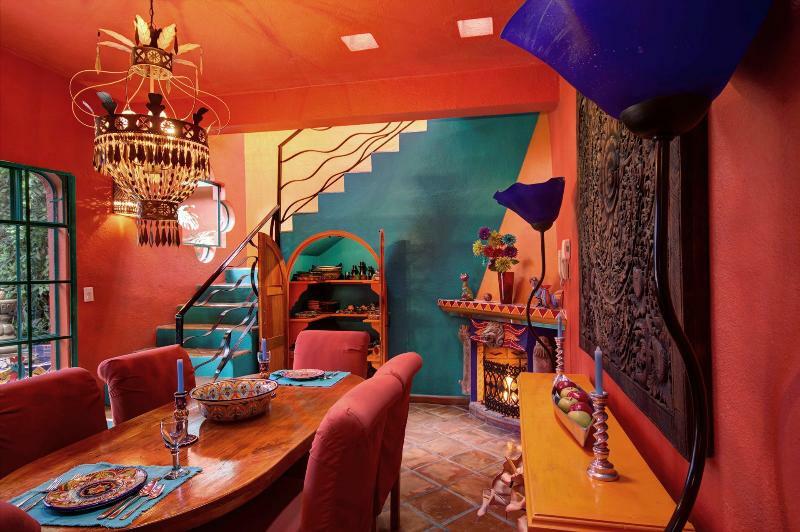 The lighting is really unbelievable, the shadows cast from all the lanterns on the colorful walls, I am enamored for sure with your home, thanks again! 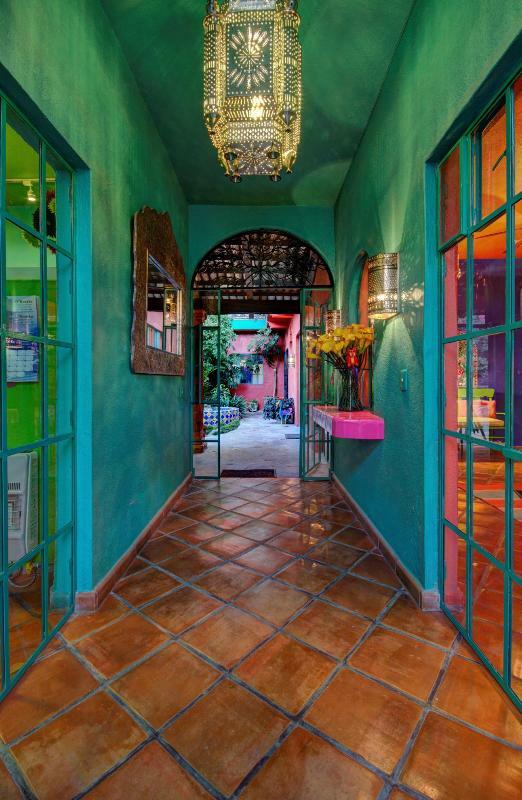 Entering Casa del Alma brings a sense of awe. You know you have entered a uniquely special sanctuary, close to everything yet quiet, serene and inspiring. 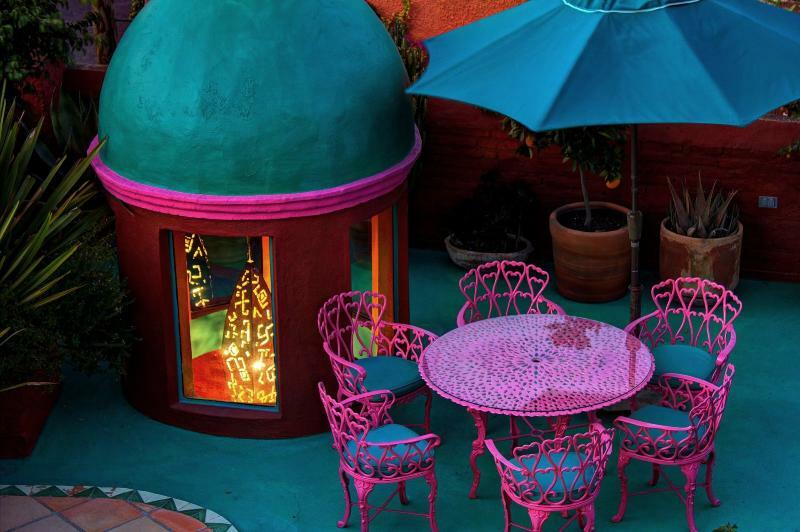 Enjoy sunrise and sunset views of the City from the roof-top Terrace. 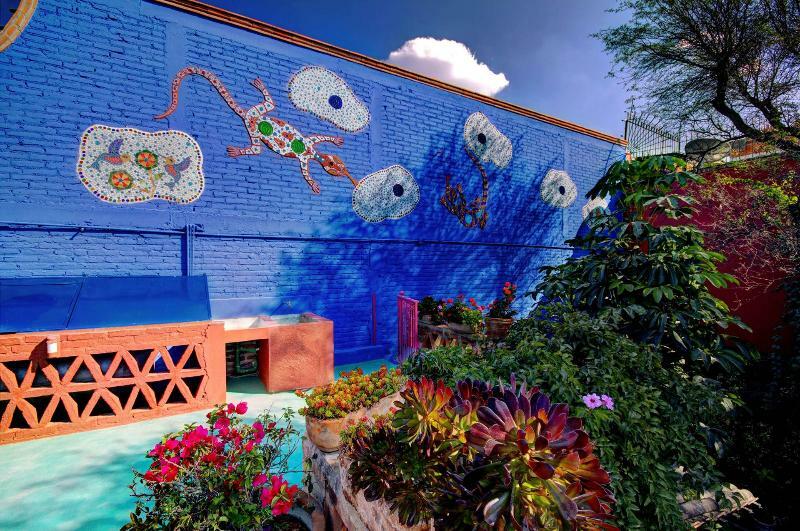 Or be entertained by frolicking Hummingbirds with morning coffee and throughout the day in the tree-shaded patio by the fountain. On cooler mornings and evenings, simply flick a switch to turn on any one of the 3 uniquely designed gas-lit Fireplaces for heat. 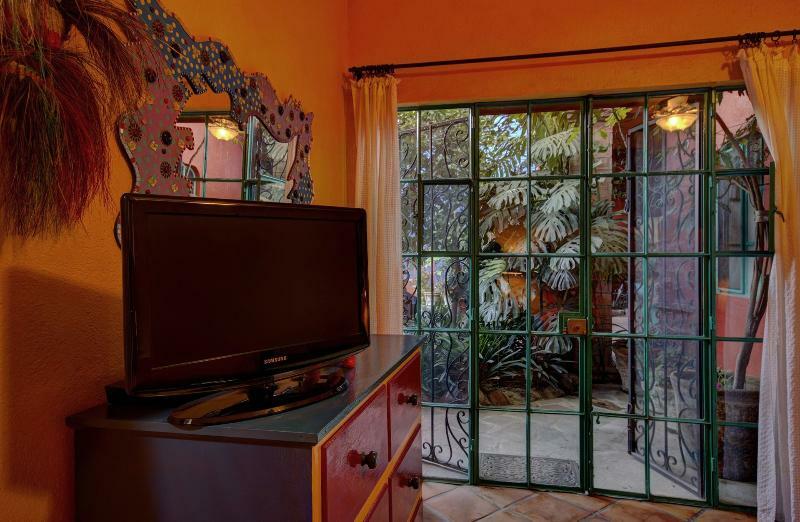 Kitchen, dining and living rooms plus bedrooms open onto lush patio gardens replete with various birds and butterflies. 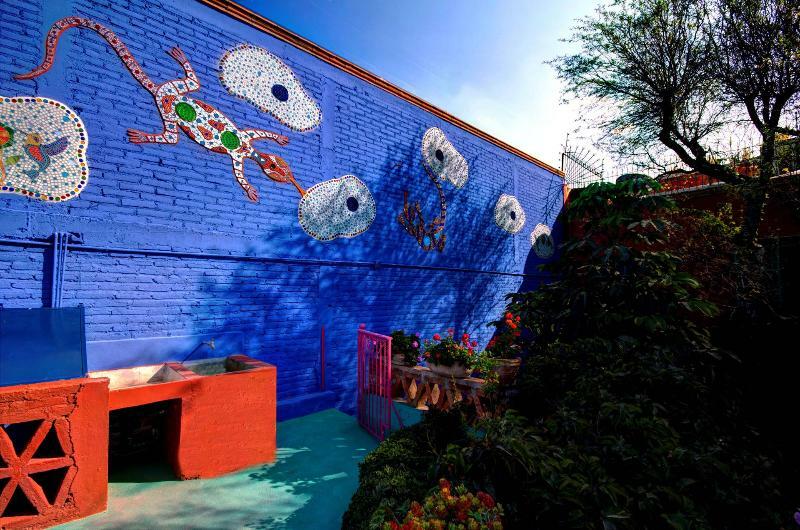 While the “Frida Kahlo Blue Wall” draws the eye upward to even more surprises. This spacious 2-story corner home enjoys a sense of openness yet privacy between bedrooms as one is downstairs and the other upstairs. 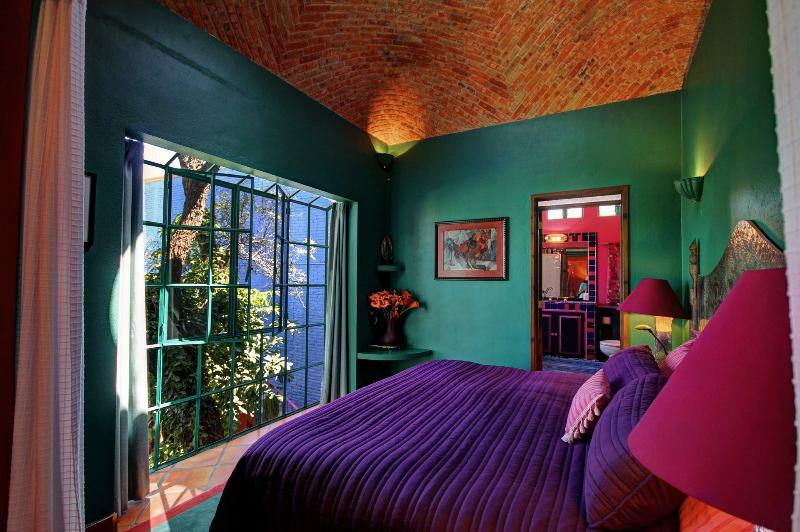 Casa del Alma has 2 Master Suites. 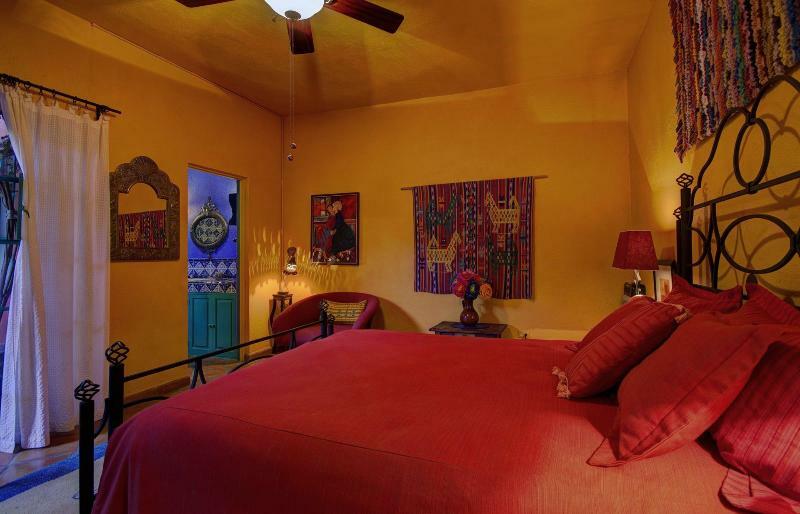 The roomy downstairs “Fountain Suite” features a hand-made Wrought Iron headboard that contains a comfortable Queen Pillow-Top mattress with good support. 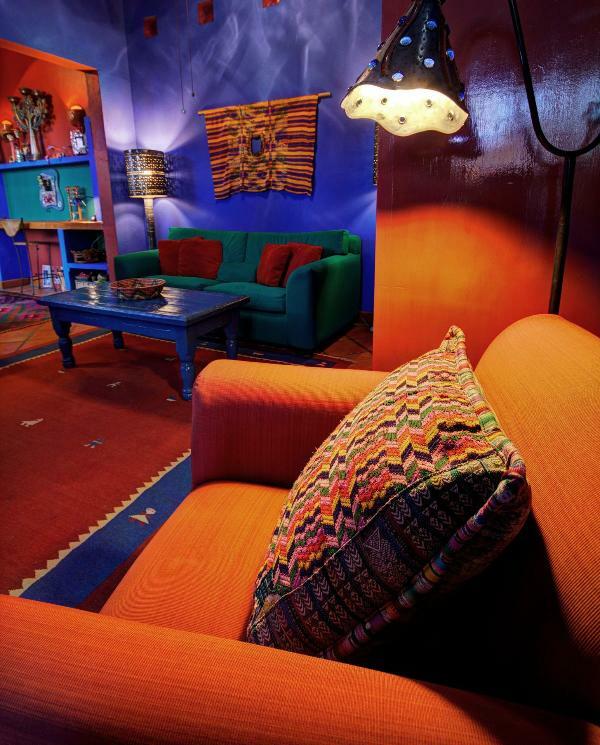 There are side tables with reading lights, a Flat Screen TV & Blu-Ray player plus a wall-heater for the cold months. 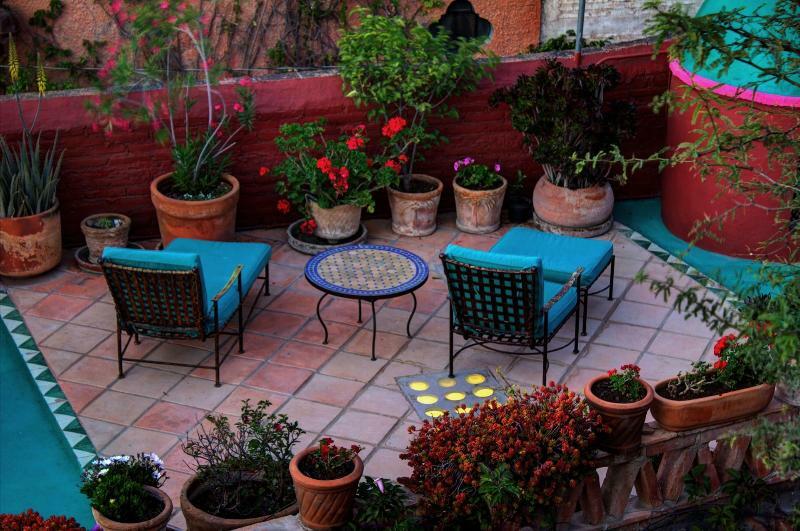 sleep by the Fountain outside your window and awaken to Birdsong from the Garden Patio. 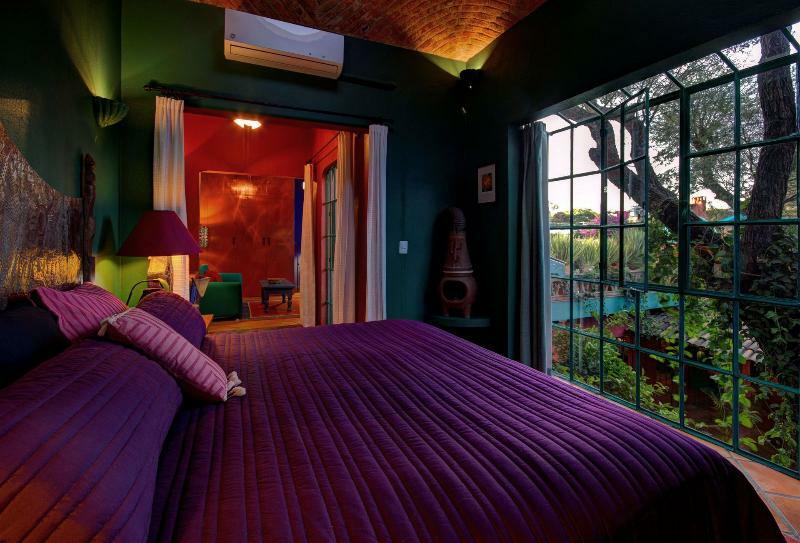 Ascending the stairway from the dining room brings you into the “Tree House Suite”. The first room upstairs, is the Family Room/Den featuring a tile and hammered-tin Fireplace, hammered-tin Cabinet, Queen Sofa-Bed and Boveda (arched brick) ceiling with a Skylight. Inside the den cabinet find a Flat Screen HD/TV with Canadian Satellite TV having over 100 English-speaking channels including connection to Netflix plus a Blu-Ray Player with dozens of DVD’s. 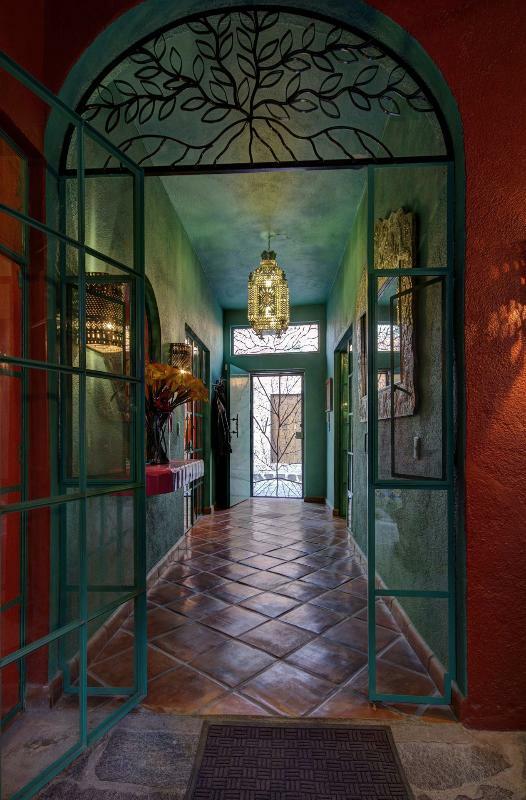 From the den, pass through the expansive hallway to the Master Bedroom. The King-sized Memory Foam Mattress boasts an elegant hammered tin headboard. Above find an Air Conditioning unit and a second Boveda ceiling with a skylight so you can view the sky and stars from your bed and awaken to birdsong from the tree outside your window. 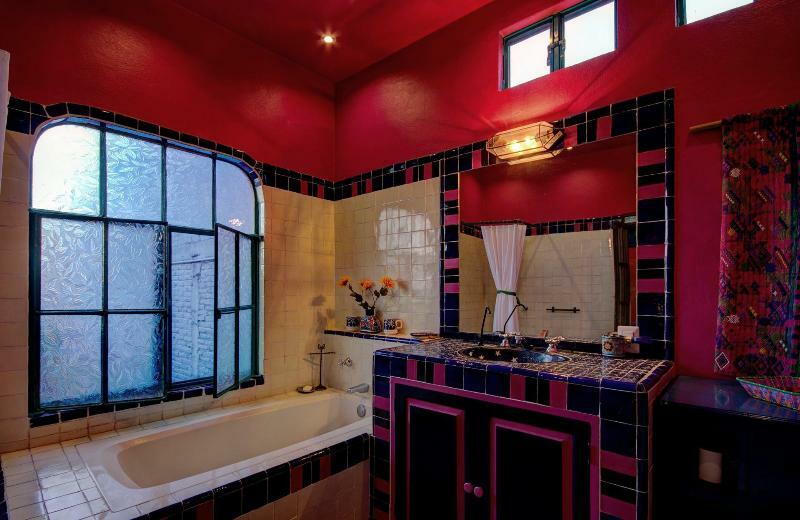 The adjacent spacious bathroom has a full sized Tub, separate Shower, Bidet, Filtered Drinking Water and Hair Dryer. The Pressurized Water system with unlimited hot water provides an exhilarating morning or evening shower. Both bedrooms have feather and non-allergenic Pillows, Quality Linens, Electric blankets, luxurious Duvets, Plush Towels, Hairdryers, Full-Length Mirrors and Designer Robes to enjoy during your stay. There are ample drawers and closets with felt hangars in both bedrooms. 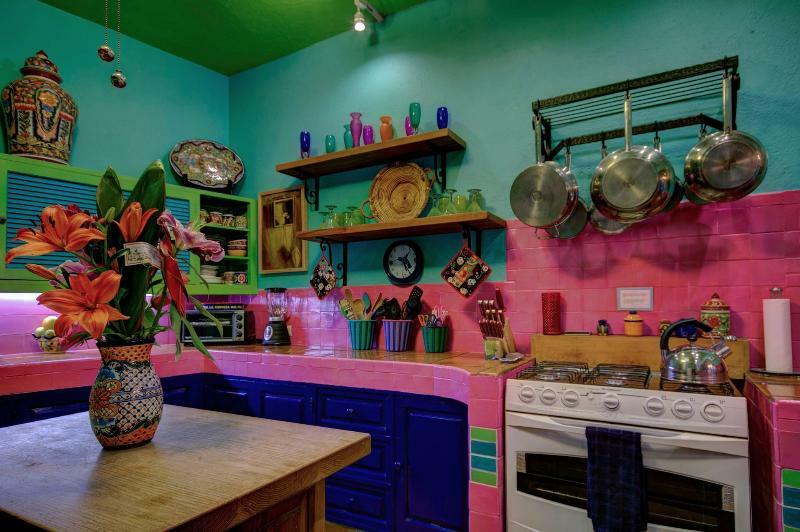 Whether eating in or entertaining, the spacious gourmet Cook’s Kitchen is well equipped with quality utensils and cookware plus hand-painted plates and serving bowls. 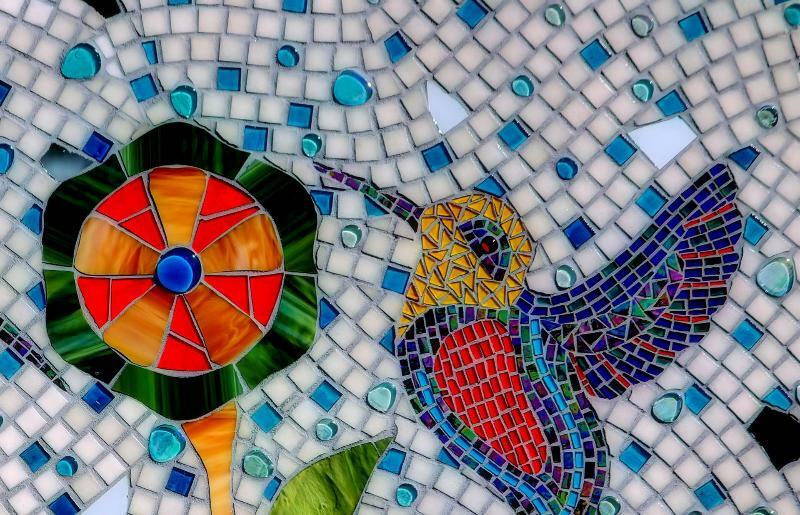 Additionally, there are ‘pass-through’ windows from the kitchen to the patio table where you can enjoy the antics of Hummingbirds throughout the day. 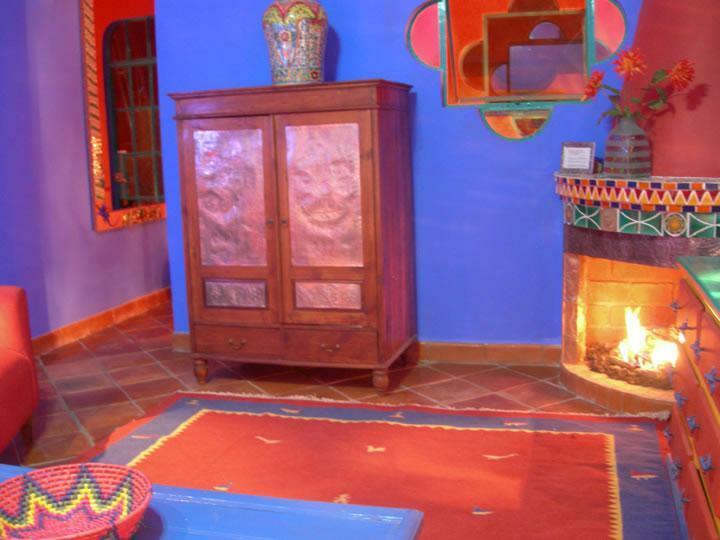 The Dining Room with its’ combination fireplace/heater and garden view is a wonderful inside place to eat. 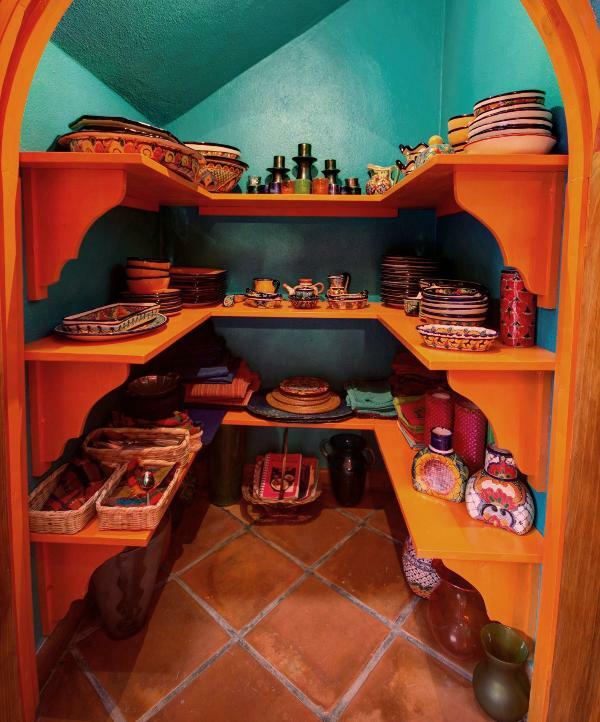 The handmade plates and serving bowls are found behind the door under the stairway. For cool mornings & evenings, three unique gas fireplaces with thermostats provide Instant Heat. 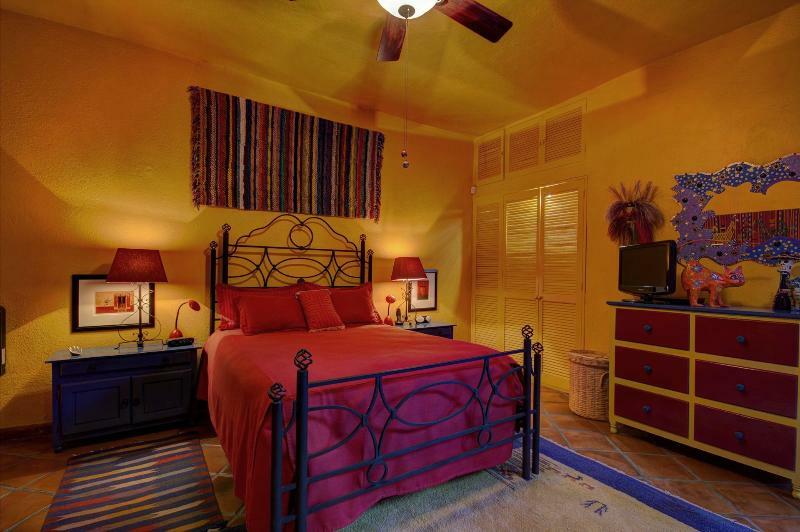 To cool the rooms, five ceiling fans ventilate both bedrooms, den, living room and kitchen. There are more portable fans, if desired, plus an air conditioning unit in the upstairs Tree House Suite. The secure Garage has a Washer & Dryer and will accommodate a small car. [9½ by 15 feet] Additional secured paid parking is available a couple of blocks away. 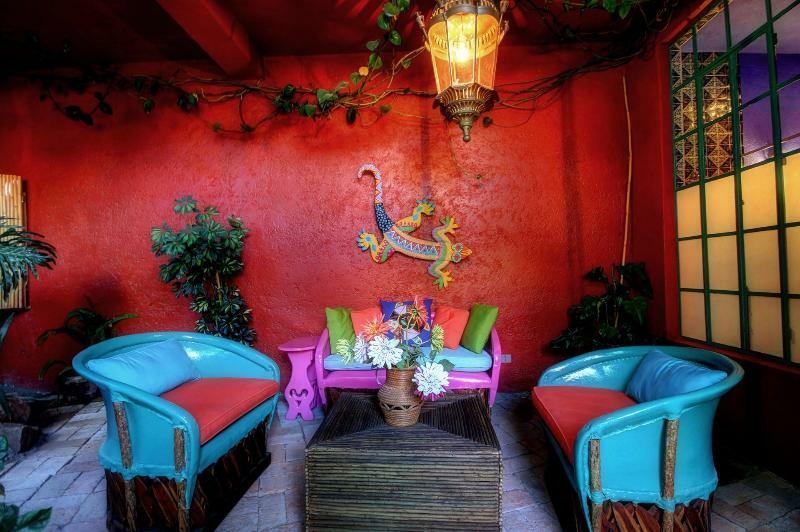 There is a completely upgraded high-speed wireless Internet network with range extenders set up so you can stay connected through-out the entire house & patios. *Plus Casa del Alma provides a secure Programmable Safe for your valuables. 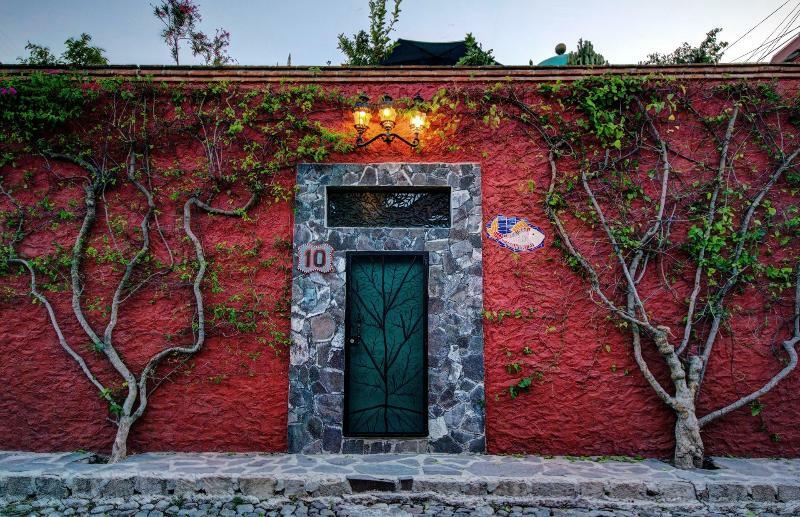 A short 2-minute walk around the corner on Del Refugio, you will find the “Dulce Corazon” (Sweetheart) Bakery with divine pies, cakes and pastries featuring the famous “Tres Leches” cake, along with ice cream, yogurts and more. 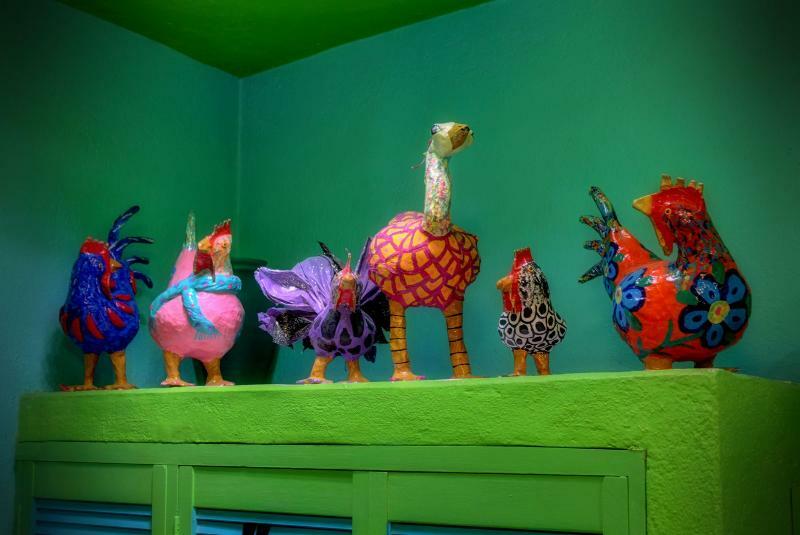 Further up Calle Refugio, it becomes Refugio Norte and you can find El Restaurante “La Rinconcita” 4.5* in yelp, a favorite of many locals and visitors. From our front door walk straight ahead half block on Calle Rosal to find the small family Tienda or grocery store. Francisco and Imelda have everything from soft drinks & cold Beer to Eggs, Light Bulbs, T.P., Cheese and more. 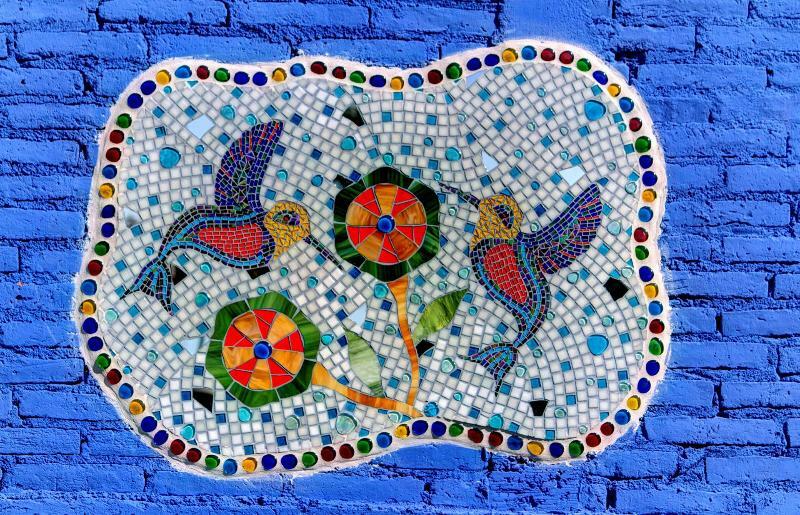 Continuing on Rosal, a 5 minute walk brings you to Canal Street. A right turn is an easy walk to the Jardin or turn left over the bridge for the best place to find Taxi’s. 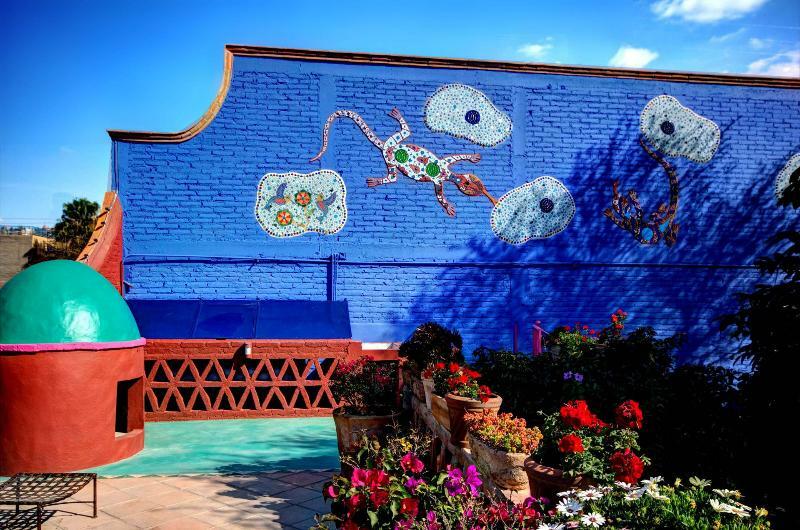 A bit further across Canal street is the large San Juan de Dios Mercado [Market] with wonderful sandwiches, chile rellenos, Fresh Juices, Produce, Flowers and more. If you don’t feel like cooking or eating out, pick up a delicious (Rostasado Pollo) Roasted Chicken on Canal and enjoy it on the Patio or in the Dining Room. 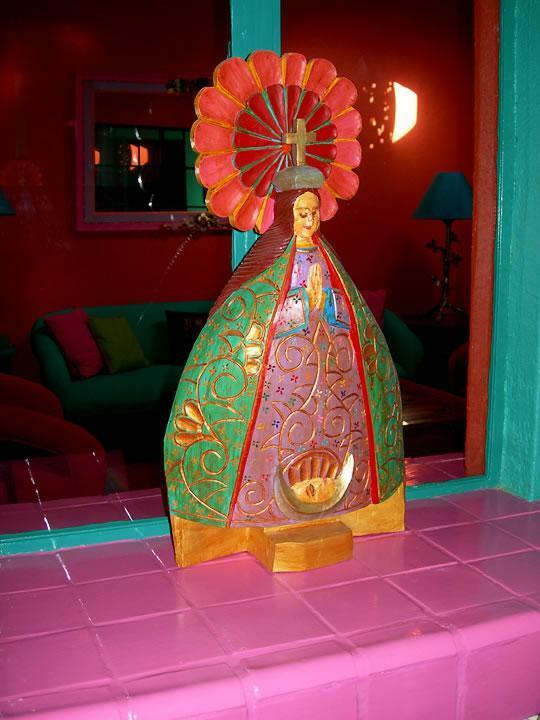 A special bonus for your Mexican vacation is our housekeeper Araceli three days a week. She cleans the house, outside areas, rooms and kitchen. 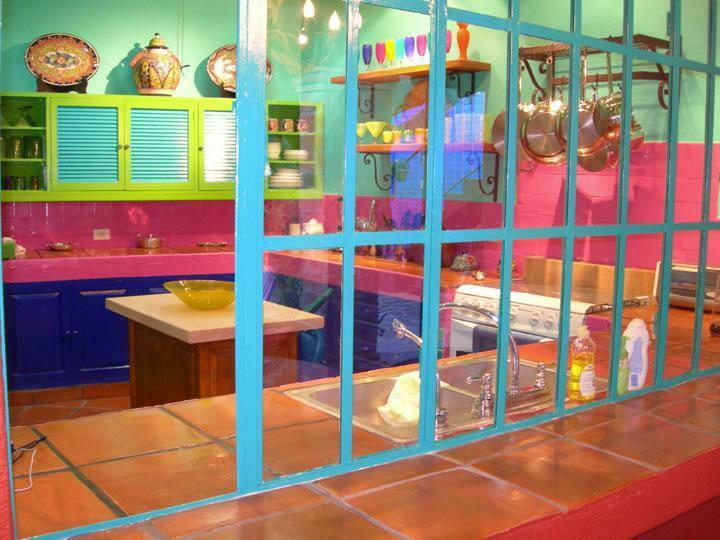 As an “extra service”, Araceli will also wash & iron your clothes, shop for you and cook delicious meals, both Mexican and American. We ask that you please tip her extra for these services. 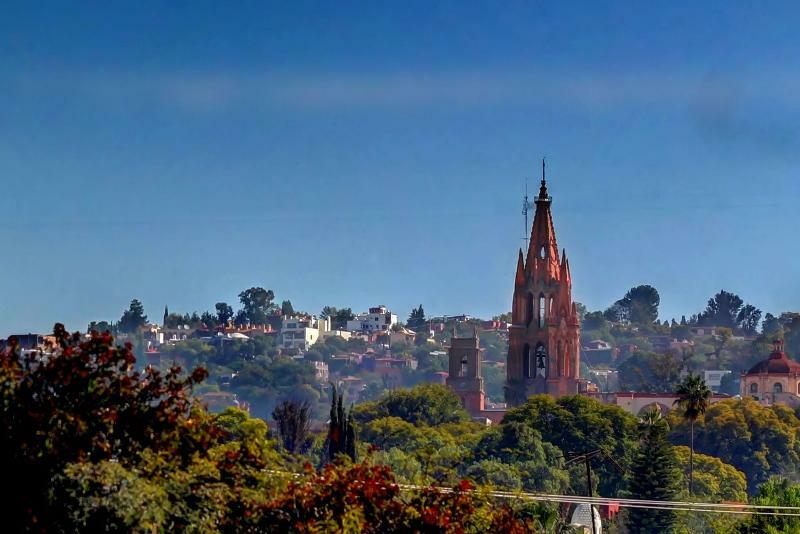 10 – 15 minutes EZ walking to Centro, El Mercado, El Instituto and El Jardin. High-speed Broadband Wireless Internet with range extenders. 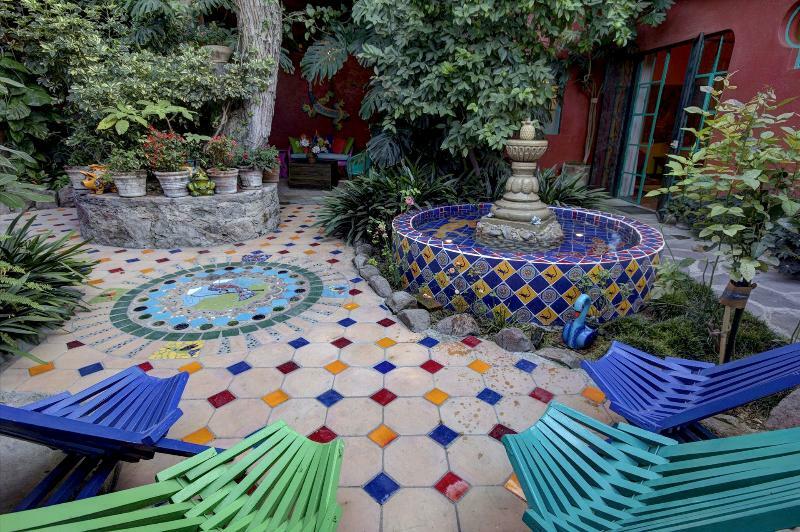 Have they been shown regularly on the San Miguel House and Garden Tour since 2005? 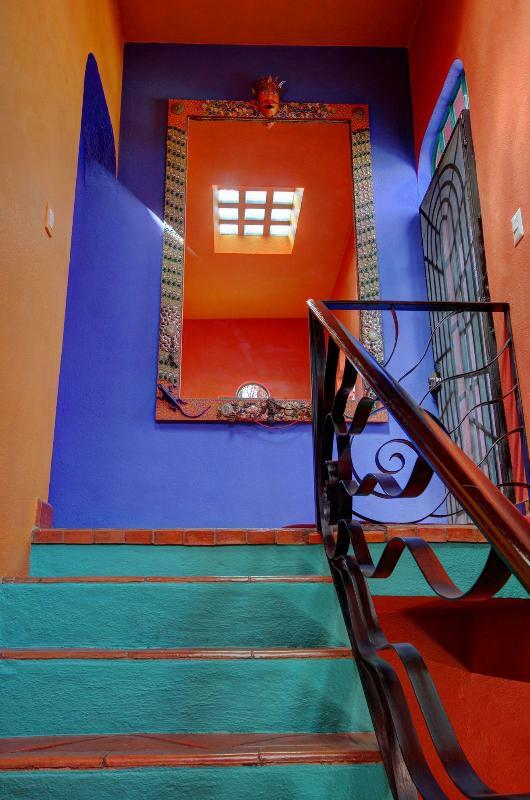 Are they on a double corner lot – spacious, light and airy versus dark, narrow with steep stairways and small rooms? Do they have 33 glowing 5 star reviews on VRBO, Trip Advisor and Flip Key from previous guests? Do they offer high-speed reliable wireless Internet throughout the house with range extenders? Do they offer Vonage telephone with unlimited free phone calls to the US, Canada and around the world? Do they provide free local phone calls, including free calls to local cellphones and 3 cordless phones plus an Answering Machine for tenant use? Do they offer Filtered Drinking Water up and downstairs? Do they provide unlimited, Pressurized Hot Water throughout the house? Are there 2 Flat Screen TV’s, CD player plus 3 iPod players with cable connectors, 2 Blu-Ray players and dozens of house DVDs? Do they offer Canadian Satellite TV with over 100 English speaking channels? 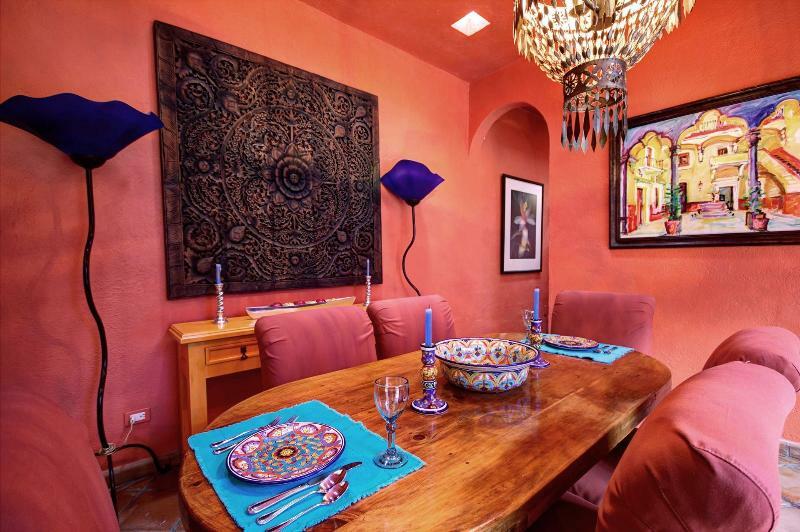 Do they have a large gourmet kitchen well equipped with quality pots/pans, utensils plus all necessities including excellent lighting and gorgeous dinner service, serving platters & glassware? 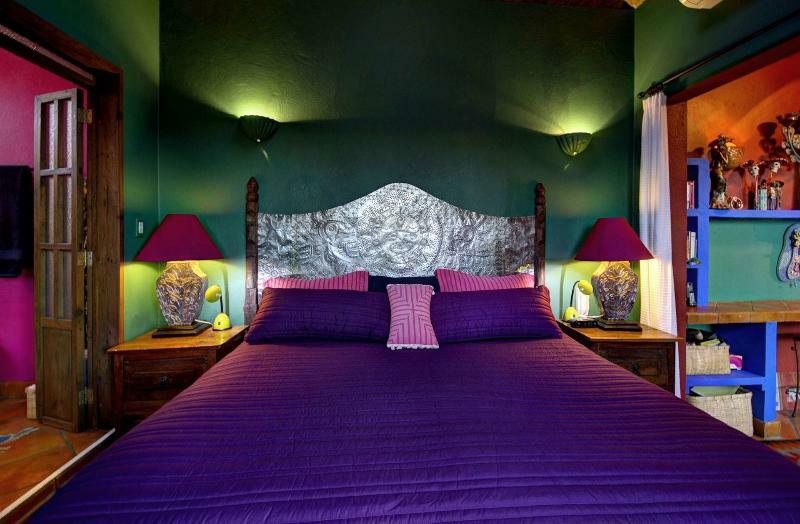 Are there firm King and Queen beds with feather and non-allergenic pillows, duvets, electric blankets and quality linens? Are there 2½ bathrooms with great water pressure and endless hot water? Does each bathroom have Plush towels, a Hair Dryer and Bathrobes for your stay? 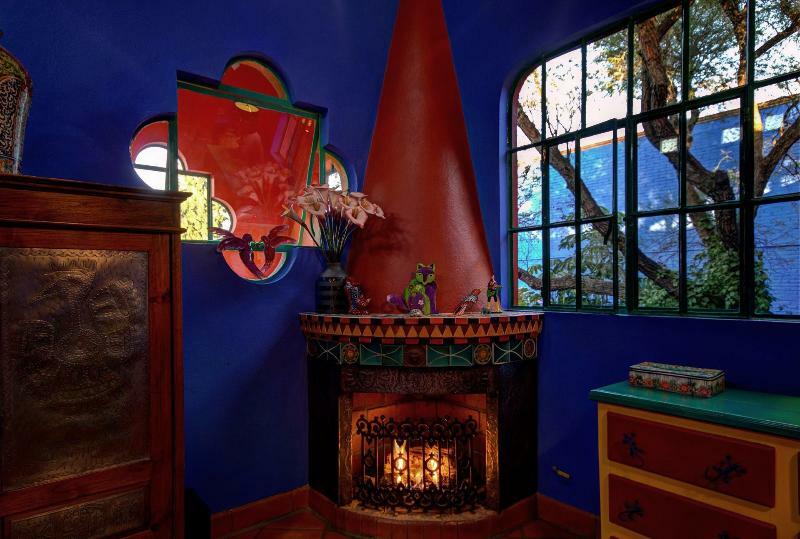 Do they have 3 gas fireplaces with thermostat control, plus additional wall-heaters in the kitchen and Fountain Bedroom. Are there screens on the windows? Are the bedrooms spacious and private because one is upstairs and the other downstairs? Are there Nightstands with reading lights on both sides of the beds, as well as, full-length mirrors in each bedroom? Is there enough Closet & Drawer Space with many Hangars? Is there a secure programmable safe for your valuables? Are there two large Patios both with tables, chairs, chaise lounges, sun-umbrella and Views of the City skyline from the upper Terrace? Is there a “House Manual” with house information and a guide to some shops, services & restaurants? Are there Street Maps for your use plus ‘Casa del Alma business cards’ with the house address and phone number for you to give to friends or taxi drivers? If the house you are considering does not have these advantages, please read our reviews and consider choosing our home for an exceptional experience. 1 Week/$1150; 2 Weeks/$2200; 3 Weeks/$2750; Month/$3100. 1 Week/$900; 2 Weeks/$1700; 3 Weeks/$2200; Month/$2650. All rates already include built in price reductions for extended rentals. Weekly rental = 7 nights. For example arriving Saturday departing Saturday. 2 weeks = 14 nights, 3 weeks = 21 nights.